No one could ever call Lady Gaga lazy. Still whizzing around the world and working as hard as ever on the Born This Way promotional trail, the singer stopped off at the 2012 Grammy Nominations Concert to deliver not one, but two knock-out performances. Fully embracing the dark vibe of Marry the Night, a zombie painted Gaga wowed the audience with a note for note perfect rendition of the 80's inspired dance song. Previously, I hadn't been that impressed with performances of the song- for example the X-factor version was too stiff, and the MTV EMA rendition was too static- but this one really brought it, with the perfect mix of theatrics, dancing, charisma, and vocals! Still playing with the left over Halloween make up, Gaga appeared again, after all the Grammy nominations had been revealed, looking like a cross between Marilyn Monroe and a panda. 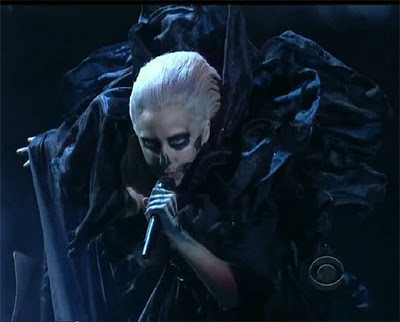 This time she performed my least favourite track from Born this way, You and I. But the genius addition of country duo SugarLand, who joined Gaga on stage, gave the song a different dimension that made the song work a lot better for me. The chemistry between Gaga and singer Jennifer Nettles was palpable and their voices complimented each other brilliantly. Real musical artistry was on display here! What was the note Gaga hit in falsetto ? You are so right, those performances were great! What is really exciting for me about Gaga is the way she is evolving as an artist, you can really see a difference in her dancing ability since she first burst onto the scene, plus her live vocals seem to be settling into a definite recognisable sound now. That duet was superb, I wish there had been a of collaboration on the album. The 'Marry the Night' vid came out today, I don't think I understand it, but on a first watch, it's certainly interesting and stylish. Don't think many people will like it but we'll see! And in 2.46 and then in 2.50? i thought... thank you and do you think she can go higher ?